THIS IS THE FUTURE OF LUXURY. In a world first, luxury goods and services will now be found in one central place on the web. 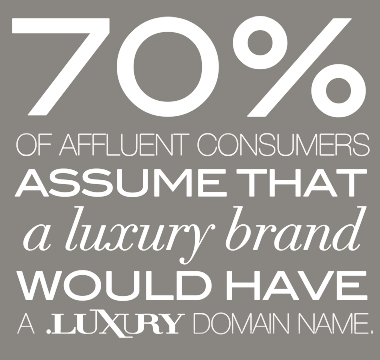 .Luxury is the new, generic top level domain (gTLD) dedicated to providing a digital platform for all things luxury. Luxury brands and consumers now have a trusted space that caters to their respective interests. Product manufacturers, service providers, retailers and consumers now have an online place to engage, transact and celebrate luxury. .Luxury represents the new Luxury Internet. Evolve your digital strategy. Join today's most innovative companies who have already committed to using new domain names for a competitive advantage. Own a memorable and relevant domain name that has strong visual impact and enhances marketing communication (i.e., eyewear.luxury; belairhomes.luxury, Simply.luxury). Get found easier through intuitive search (i.e., handbags.luxury). Build a brand on .Luxury or use a .Luxury domain for a new product launch, unique service offering or marketing campaign (i.e., VIPexperience.luxury, ritzspa.luxury). Protect your trademark and your brand. Target your message to the right audience. The '.com' world appeals to the mass consumer. .Luxury is uniquely positioned to focus on the elite customer market. to reach the elite customer market, catering specifically to the Internet's 1%. .Luxury ensures your association with luxury. Attract the optimal consumer audience through more relevant domains and search terms. Create a virtual experience that caters to your elite customer. .Luxury highlights your brand like never before possible. Your .Luxury online presence helps to reach your target audience more meaningfully and better communicate your message. Participate in a community that is aligned with luxury brand values. Carefully developed registry policies protect brand interests. Strategic brand and media partnerships on key generic vertical and geographic sites will bring traffic, relevance and credibility to .Luxury. .Luxury allows consumers to more easily find luxury information, purchase trusted luxury products, and socialize around their passions. 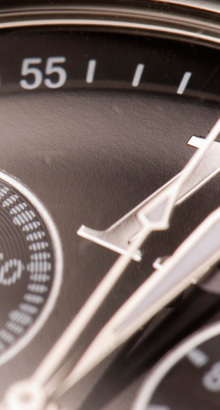 Through a premium priced registration model, a robust and collaborative registry enforcement policy, and a consistent experience across key generic sites within the platform (i.e., Paris.luxury, Watches.luxury), .Luxury sets itself apart.